Motive of this article is to educate you people that about various business ideas you can start in New York with almost no investment & profitable at the same time. It’s a waste to spend time and money on business every single person in doing. 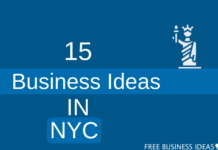 These 41 unique ideas may give a kick start to your new business.